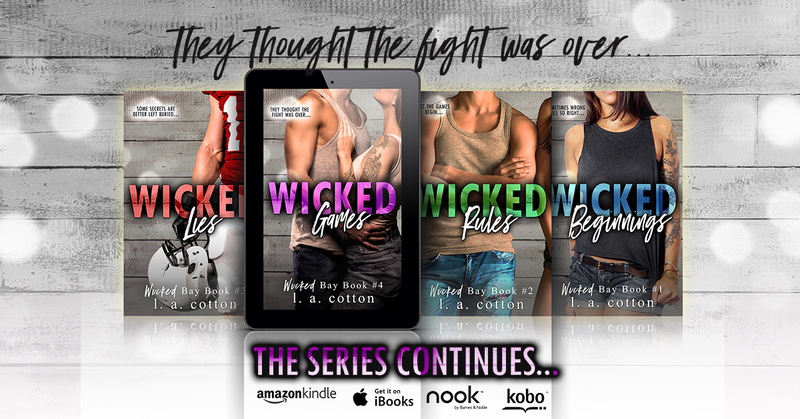 The fourth book in the bestselling YA/NA crossover series from L A Cotton is LIVE!!! Lo Stone thought her life was finally on an even keel. As if being a senior and having to think about her future isn’t bad enough, she’s a stranger in her own house. And the longer she goes without seeing Maverick, the harder it is to ignore the little voice of doubt whispering in her ear. 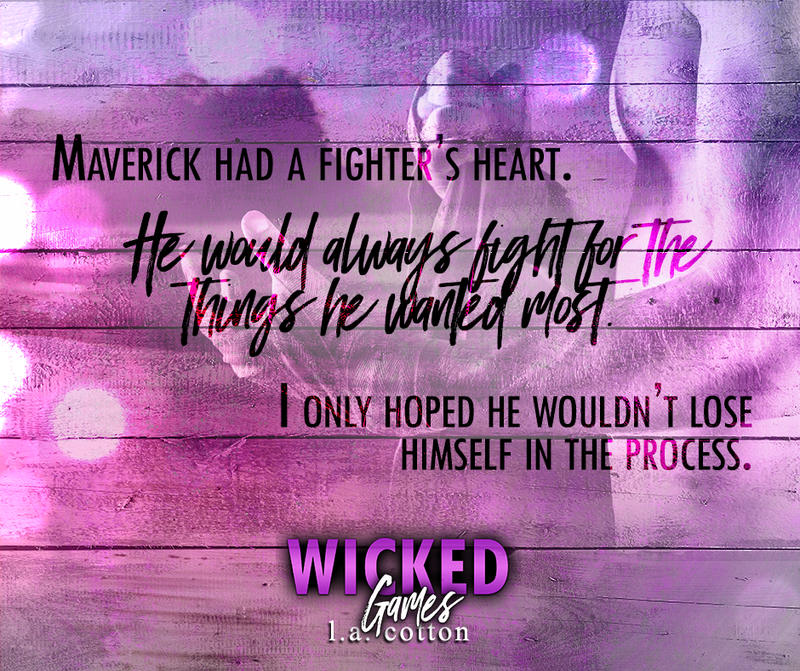 I received an ARC of Wicked Games by the very talented Author L A Cotton. In exchange for an honest opinion. This is my (mismousey) very honest opinion of her book. Having read several of Ms. Cotton’s book’s already. This one is written in her tremendous style of intrigue, love and suspense. She has you at the edge of your seat( page). Wanting more and more of the story. 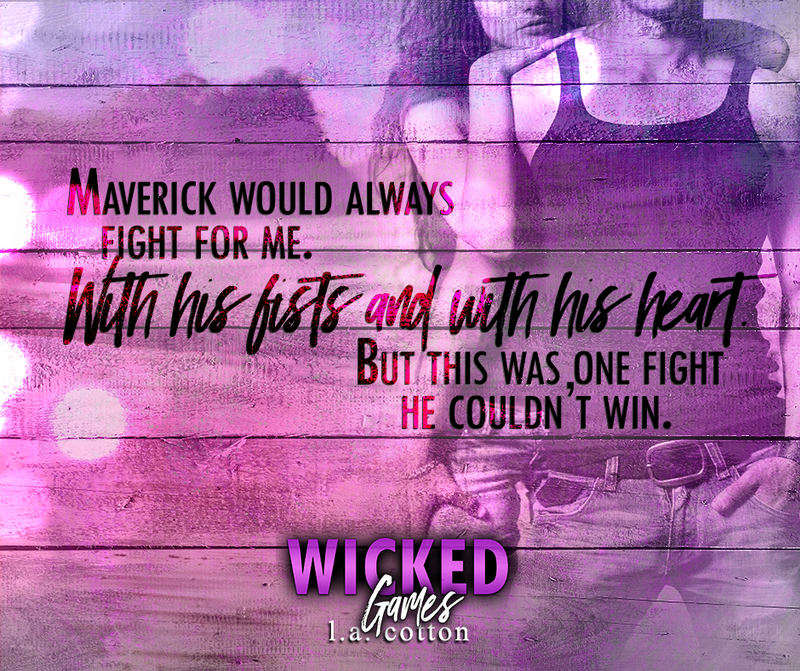 In this particular book Wicked Games- we find our main characters Maverick and Lo going through changes. Maverick is now away in college playing basketball. And Lo is left behind during her senior year at high school. ( In order to beable to actually follow this couple and understand all the challenges they have faced. You will need to read the first books in this series.) Lo gets a job at a spots bar as waitress. Things at home are sorta hard for her. Along with having to handle the issue of her boyfriend being in college. Back in college the Zack is the head of the frat and he likes to play games. Bad ones.But there is someone else that has been playing games with Lo. Who you ask and what happens?? These are the wicked games they play. And you need to read ths hot story! I recommend this book to all young adults, who love a good contemporary romance. I give this a 5 mouse paw rating. Now what are you waiting for? Run and get your copy at the the nearest location today. Ms Cotton- I look forward to the next in the series. Got to have more of Maverick and Lo! car, pressing into me, showing me just how much he’d missed me. murmured, curling my hands into his t-shirt. you,” he breathed between kisses. away and stared down at me with those intense eyes of his, my mind cleared. missed me and just had to see me but there was something glittering his eyes. it softened something inside of me. moment either. So I sat quietly while he drove us back to his house. you’re here,” I said as he pulled into the drive away and cut the engine. things had been since Stella and Bethany had moved in a little over a week ago. climbed out of the car. Maverick smirked, holding out his hand for me. dropped his eyes to his crotch and I rolled my eyes. mention the fact it housed three of my favourite people. pulling me toward the pool house. want to waste a single second of it. ← 5 ACRES FOR SALE IN DAY TOWN LAFAYETTE COUNTY FLORIDA STEAL AT 25,000.00 CASH!! !